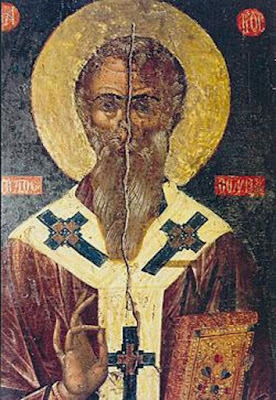 Saint Ariston (or Aristos) most probably was born in Paphos and lived at the end of the fourth and early fifth century. He was the second consecutive Bishop of Arsinoe. The first was someone by the name of Nicholas. 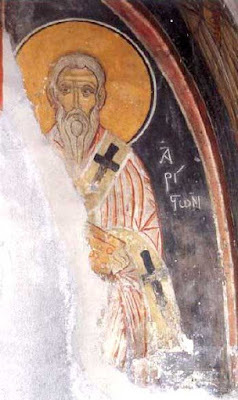 Nicholas was followed by Ariston and later by Saints Nikon and Arkadios. Saint Neophytos the Recluse wrote a brilliant eulogy about these Saints and considers them equal in worthiness with the Three Hierarchs of the Orthodox Church - Basil the Great, Gregory the Theologian and John Chrysostom: "The wondrous Arkadios, and the one named after victory, Nikon the Great, and Ariston the famous, who excels in contest against demons, the three-voiced lyre of the Spirit, the three-layered base of the Church...." After living a virtuous life and shepherding his flock with zeal and good works, he reposed in peace. Ruins of a church dedicated to Saint Ariston survive in the village of Choli of the district of Paphos. The Chapel of Saint Ariston stands lonely and abandoned on the northern edge of the village. More precisely, it is located about three hundred meters from the main church. As it is stated by older residents of the village, the chapel used to cause awe and admiration for both its simple, yet stunning architecture, and its interior decoration. In particular, the interior of the chapel was decorated with frescoes and icons up until eighty years ago. Previously, the church was maintained by a few monks from Mount Sinai, who lived in the nearby Monastery of Saint Katherine of Fitefkia. The demolition of the church, as preserved in oral tradition, took place after the sale of the land which it was built on to a new owner. The latter, always in accordance to tradition, commanded a Turk to demolish the church and after three days of its demolish, he died. You were an excellent hierarch to your flock, wise one, making them altogether brilliant with the light of Christ God, blessed Ariston; wherefore your soul also, divine angels bore, that you may receive the crown, of a faithful steward. Cease not to intercede on behalf of those who honor you. Divine torch of Arsinoe, and the ornament of all Cyprus in Christ, filled with various miracles, Ariston the great, we honor you with hymns.